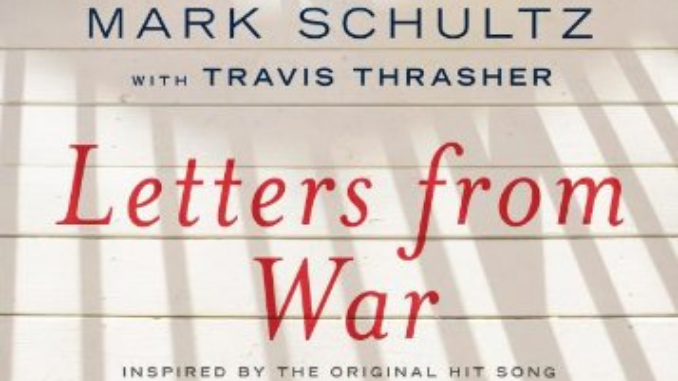 Platinum-selling Christian music artist Mark Schultz pens a novella based on his award-winning song “Letters from War,” about a mother’s unwavering hope, courage, and steadfast prayers.Every night, Natalie leaves the front porch light on. Just in case. It’s been two years since her son, James, went missing while saving the life of a fellow paratrooper in his division. Natalie’s faith has sustained her while she awaits word on her son’s whereabouts. Well-meaning friends encourages Natalie to move on, but Natalie continues to hope. Missing In Action – It has got to be one of the most dreaded acronyms any military family can hear. KIA—killed in action—hits swift and hard. Certainly difficult, incredibly difficult, but also certain. MIA shreds hope until nothing but a single strand remains. And with each passing day that thread grows thinner and thinner. This is the world in which James Thompson’s family has lived for the past two years. Barely holding on. Wondering if each phone call will bring great or dreadful news. Unsure if moving on means giving up. Stuck. It’s been two years since James Thompson went missing in Afghanistan. He left behind his mother, Elizabeth; a sister, Emily; a young wife, Britt; and a son he’s never seen. He also left behind a slew of letters…Letters from War…that express his love and devotion for both family and country. The story primarily comes from the perspective of mother and son—Beth providing the context for the present storyline while we get James’s perspective of the past in flashbacks. Letters, of course, play a dominant feature in the novel and help express the character’s emotions even while providing context for the past. The result is an intricately woven tapestry that is both beautiful and complex, taking the reader on a heartfelt journey through a saga of a mother-son relationship. Secondary characters are not ignored, as Schultz and Thrasher also explore the heart of a wife who must raise her son unknowing if he’ll ever meet his father. It is the touching personal relationships, drawn out in this story especially through the letters, which give the novel its emotional intensity and prepare the reader for a tear-jerking—if not unexpected—conclusion. Dove Award-winning singer/songwriter Mark Schultz gets top billing here and the story’s plot is based upon Schultz’s song of the same name, but author Travis Thrasher should not be neglected either. Thrasher brings Schultz’s song to life, fleshing it out and lending his distinctive voice to the novel. Thrasher’s novels have long been infused with music, so this marriage of prose and lyric flows flawlessly. Fans of Schultz will be ecstatic that his powerful song has found a new home in a novel while fans of Thrasher will be reminded that writes well in whatever genre he’s handed. An infusion of hope and warmth to all who read, Letters from War is sure to leave an imprint upon your heart. May God bless our military and their families for doing what they do in order to make the world a better place. To those who have been through the trials of having a loved one at war, I salute you for your strength and courage. To all my friends and colleagues who find themselves a part of the military—from Iraq to Afghanistan, from West Point to the Air Force Academy—I thank you for making the world a better place through your sacrifice. Let us never give up hope.